I've been in Amateur Radio since 1974, and still find new and interesting things to do. I like to build, restore, and operate on the air. This is a blog of various info about my Ham Radio operations and activities, projects, and opinions. Visit www.WB4IUY.net for the lowdown at WB4IUY. This is a nice fan dipole drawing from YC8PVU. I have built many of these over the years with different band combinations. You can add 160, WARC, & 6m using same concept. Nice to have muitiband antenna that doesn't require an antenna tuner and automatically bandswitches. These work great! The 30mm (a little over 1") separation at the feed points is good, but I try to keep the distant ends about 6" apart per band. I've found this helps minimize coupling that causes your wire length measurements to be a little off. Cut your wire...s about 5% longer than the typical dipole formula, to give yourself some tuning range. Tune the lowest band wires first, and work your way up to the highest bands. Don't solder the wire wrap at the distant ends (where it comes through the insulator and wraps back around and twists onto itself to secure it) until you're finished. Just twist and pull back up for testing. 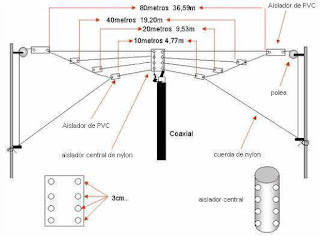 You'll have to tune the whole antenna system about twice because there is a little interaction between bands, but when you're finished, it's a killer and simple setup. I've even put this in the attic of a friend's house by stabling it to the rafters nearest the roof, and 'zig-zagging' the low band wires (80 m) just to get is all up there. Tuned it up, and he was working DX with 100w like mad. Was a good answer for him, because he couldn't have any outside antennas! 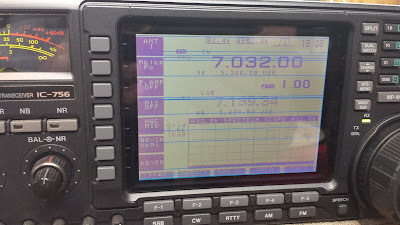 My FT-901 back on the air!